It was a rocky, palm-covered inescapable island which rises 40 meters above the sea level. Very few convicts managed to escape from this island by crossing the piranha-infested Moroni River via Dutch Guiana or overland to Brazil and then through hundreds of miles of swamp and jungle to the nearest settlement. A Dutch soldier, stationed on the Maroni River, once heard a piteous screaming from the river after dark and went to investigate. About 25 feet from the bank he saw a convict struggling forward, with the water boiling beneath him. Fist-sized chunks of flesh were being torn from his arms, face and chest. The piranhas were skeletonizing the convict before the soldier's eyes and soon the convict sank screaming into the dark brown water. No one knows how many convicts fell victim to the piranhas of the Maroni, but even this horror did not prevent them from trying to swim the river to escape the dreadful incarceration. And from here Henri Charrière, the author of Papillon who was sentenced to life imprisonment in the 1930's for a crime he did not commit, succeeded to escape by throwing himself into the rolling waves of the ocean from a cliff using a bag of coconuts as his raft which drifted him towards the mainland after four days and three nights adrift in the sea. In 1970 Papillon, the autobiography of Henri Charrière, was published and it set the world on fire giving the horrific accounts of the misery and inhumanity of the French penal colony which was in use from 1852 to1946 and the book sold millions, becoming one of the best sellers of all time. However, the distressed people of Rohingya ethnic minority community of Arakan State of Burma have been continuously trying to cross to the neighboring countries like Thailand, Bangladesh, Malaysia and India in search of safety and food. The military regime has closed all the doors for their easy survival, suddenly making them illegal immigrants in their own motherland where they have been living for centuries, through an amendment in Burma's citizenship law in 1982. They are not permitted to move from even one village to another without the permission of the authority. The farming, which remained as the only resource for their survival, is also being axed from time to time by the repressive machinery of the regime through so many restrictions that life has been made unbearable for the Rohingyas in Arakan. Today, being uprooted from their own motherland, over 1.5 million Rohingyas are roaming in different countries of the world including Thailand as status less gypsy human beings. Last November 26, 2007, a trawler and two engine boats overloaded with Rohingyas while preparing to cross to Malaysia, sank in the Bay of Bengal off the Maungdaw township where only about 150 out of the 240 could swim to the shore and have gone into hiding to evade arrest, and the rest have gone missing. Later, only 5 bodies were recovered. Last Feb 03 2008, a boat packed with Rohingya refugees drowned in the Naaf river which runs in south-eastern Bangladesh forming part of the 320 km border between Bangladesh and Burma. Later four bodies of the Rohingya women were found. On March 3 2008, the Sri Lankan navy rescued 71 people mostly the Rohingyas on board a 50-feet vessel which was found drifting in the Indian Ocean after its engine failed while the people were heading for Malaysia or Thailand seeking employment. Twenty other people died on board from a lack of water and food as the boat drifted for 12 days. The vessel was about 170 miles away from the eastern coast when the navy found it after being tipped off by fishermen. These are a few which came to the notice of people, the concerned authority or the news media and there are many incidents which have slipped away unnoticed as the Rohingyas resort to unnoticeable routes in most cases to escape which are full of risks of life and death. Such episodes amply demonstrate the appalling conditions in Arakan which have been driving the people to such desperate attempts to escape. However, on March 28 2008, the Prime Minister of Thailand Samak Sundaravej said that the Thai Navy is exploring a deserted island to place all the Rohingyas living in Thailand mostly as undocumented refugees. He made the statement after emerging from a two-hour long meeting of the country's National Security Council. He expressed his intention to show the Rohingyas "life here (Thailand) will be difficult". 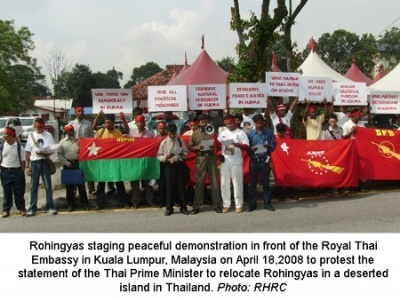 But he could not show any single point of wrongs or crime that the Rohingyas have ever done in Thailand for which he has decided to banish the entire Rohingya ethnic community to a deserted island in violation of several UN and International laws especially the 1967 Protocol of the Geneva Convention regarding the statelessness. The Thai Prime Minister is a staunch supporter of the Burmese ruling generals and he said he has new found respect for the ruling junta after learning that they meditate like good Buddhists should, turning a blind eye to the series of atrocities that the military regime has committed even against the revered monks who are the dharma sons of Buddha. The Thai Prime Minister said," We want electricity. Burma has allowed us to build a dam. We want to sell goods there. Burma will build a port. Is that not good for Thailand?" So, in order to build up a celestial empire, the Thai Prime Minister wants to offer the innocent Rohingyas as the requiem in the altar of tyranny of Burma's military rulers by sending them to the island of Death where if the Thai forces can place the Rohingyas today, then tomorrow the Burmese forces will land in that island and thus massacre the entire Rohingya men, women and children who escaped before from the paws of the Burmese military junta, beyond the notice of the international community. What is going to happen to the Rohingyas when they are abandoned on that island? What will be awaiting there for them? Presenting a cartoon idea regarding the aftermath of the ostracization of Rohingyas in a deserted island, Dr. David Law said: Frame #1 "Think of a small cartoon island -- a simple oval shaped piece of land with a couple of coconut palms surrounded by water. On the left side of the island is a Thai Navy boat forcing Rohingyas off the boat and onto the island." Frame #2 "On the next frame is the same island filled with Rohingyas. The Thai sailors have gone, but now the Burmese Navy sailors are landing on the right side of the island." and Frame #3 "On the third frame are the Burmese sailors shooting down the Rohingyas, there is a lot of gunsmoke and bodies on the island and floating on the water and blood is everywhere. On the foreground, in the water, a couple of fish are saying, "there are no witnesses except us". In fact, the statement of the Thai Prime Minister rocked the world conscience. It has sent a wave of shock and grief among the whole Rohingya community. It has sparked outrage of the international peace loving community. Due to decades long political oppression, economic exploitation, social degradation and cultural slavery, the Burmese military rulers have turned the peace loving Rohingyas into a powerless, defenceless and voiceless crippled community. They are under the threat of extinction through systematic genocidal operations of the Burmese regime. Rohingyas have been crying in corners and dying in silence decades after decades. Now, if the humanitarian people of Thailand as well as the international community can not stop the deportation of the Rohingyas to the island of death, it will just add another notch of genocide on the scale of man-made tragedies of Rohingyas. However, the Rohingyas hope that the sympathy of His Majesty King of Thailand to their plight can bring a halt once and for all to such an inhumane decision of the Thai Prime Minister. His Majesty King Bhumibol Adulyadej who is the world's longest serving monarch, is revered as having perfect Buddhist qualities. In Thailand, His Majesty King is accorded an almost divine reverence, with titles like Phra Chao Yu Hua (Lord Upon our Heads) or Chao Chiwit (Lord of Life) who has an extraordinary bond with the people and remained as a reassuring anchor amid any whirlwind of the country during his six decades on the throne of Thailand reigning through 17 military coups and 26 prime ministers. Image Use Information: There is no restriction to use the RHRC image with this article. Dr David Law has formally consented to input his cartoon ideas in this article.